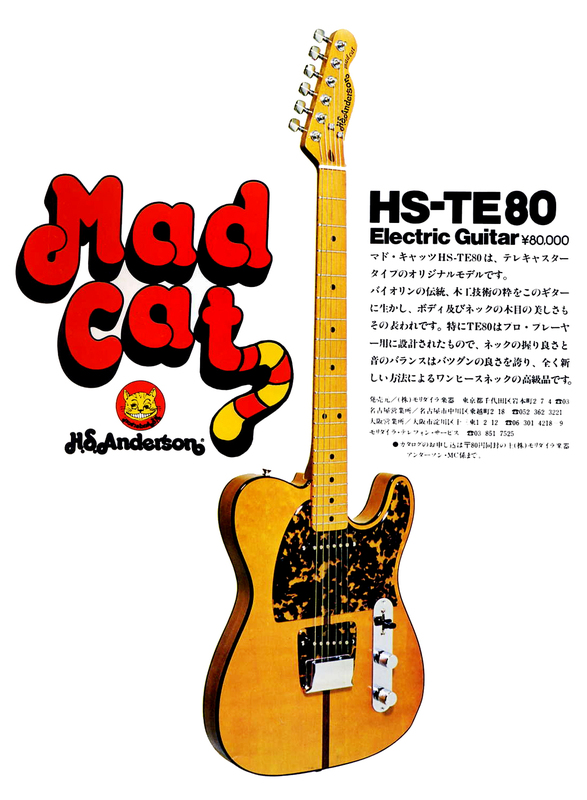 Mr. Shiino said that the original design of MADCAT came from the Takahiko Ishikawa who is top guitarist here in Japan (Maybe Mr. Ishikawa played over 10,000 songs…!!! He is mainly playing the acoustic guitar). Anyway, when they have a drinking, Mr. Ishikawa just wrote the original design of MADCAT. A few weeks later, Mr. Shiino added his idea and made the prototype of MADCAT. Well, about Mr. Shiino, you could check my JV history page. The logo mark was designed by Mr. Atsuro Yamada who is currently Managing director of Gramco Ltd – Top Strategic Brand Consulting Company. Mr. Shiino and Mr.Yamada were a good friend, and Mr.Yamada designed the logo mark and even MADCAT illustration. The Morris factory for H.S. Anderson was independent from Morris Acoustic guitar factory in Nagano. I’ve heard hat 3 craftsmen (Mr.Shinoda, Mr.Imafuku – He is Fujigen manager currently and other craftsman) made H.S. Anderson brand guitars. Early days (1973 -1974) made Madcat hasn’t got the serial numbers and signature in cavity. Later day (after 1975), H.S. Anderson guitars have their signature of these builders somewhere – PU cavity. Of course, Mr. Shiino left already (He established the ESP in 1975). Music-trade has a beautiful Mad Cat in their collection that is unfortunately not for sale, which I can understand. I have actually never seen a real H.S. 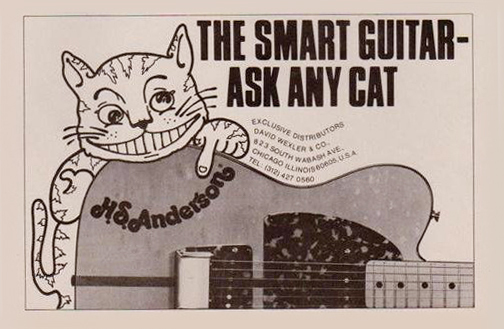 Anderson Mad Cat on eBay, only later versions made by Hohner, they were made in the Moridaira factory too, at least the first versions. The later Hohner “The Prinz” guitars that came in the 1980’s were most likely made in Korea by Cort. There has been numerous re-issues of the original H.S. Anderson Mad Cat, some better than others. Now there is one called Vintage re-issue Mad Cat made by Moridaira, the plant that made Morris and H.S. Anderson back in the 1970’s. Here is a review from Premier Guitar.